Professional features for multi-store retailers. 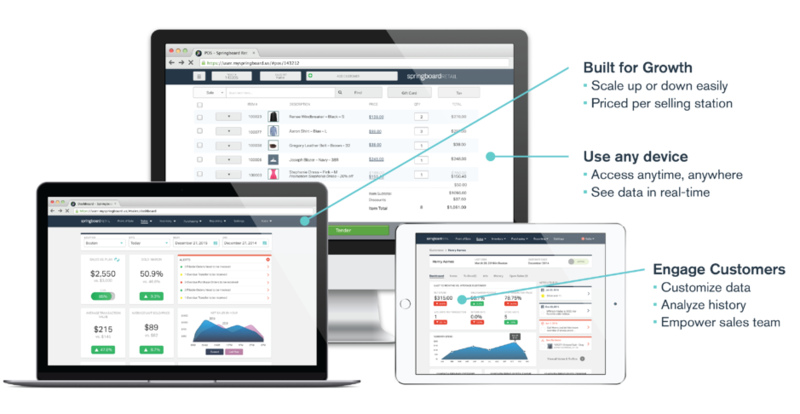 Accelerate performance and gain insight across all your channels. Data is a driving force behind successful retailers. Luckily, Springboard Retail is more than just a Point of Sale, it's a powerful Retail Management System designed for today's complex retail environment. Built to be highly flexible, Springboard is intuitive yet powerful and built to support your unique business. Truly built for multi-store, Springboard Retail is a powerful retail hub for your enterprise. Springboard Retail was designed and built as multi-store retail management software. We’ve sat in your seat and felt your pain. We know a store-by-store view of inventory limits your ability to sell. Period. With Springboard, multi-store management is innate. You’ll see real-time inventory across every store. So you can sell that size 8 sweater in Portland just as easily as the one in your hand in Boston. Plus, the sale will be credited to the store that actually sold the item (not the store that shipped it). It's quick and easy to move inventory between stores, so you can allocate merchandise to the store you know will move it. Learn more about our multi-store inventory management software features. Gain powerful enterprise-grade tools to help your business grow, profitably! Want to learn more and get a quick overview of Springboard?